1. Greece joined the Eurozone in 2001 and was Eurozone’s 12th member. 2. Greece was the first country in need a bailout in 2010 in the Eurozone. 3. Greece is the only Euro country with restructured debt. 4. Greece got a third bailout with the total due debt in 2015 accounting for roughly 173% of its GDP. 5. Greece’s prime minister resigned calling for fresh elections in September. 6. Greece had one of the lowest ratings among the 18 EMU members when it joined the currency union (2001). 7. While Portugal and Ireland have paid off the debts, Greece continues to seek for more bailouts. 8. Greece has raised doubts of a being the first member country to exit Eurozone (dubbed as a Grexit by media). 9. Greece has so far using bailout packages to repay existing debt rather than rebuilding its falling economy. 10. Greece received the highest number of upgrades between January 1998-December 2008. As Greece entered the Eurozone, doubts about its economy started doing the rounds. The GDP per capita PPP is the country’s gross domestic product, adjusted by purchasing power parity, divided by the total population. It captures the individual performance of Greece as compared to the entire Eurozone since its inclusion in 2001. * The GDP per Capita, in Greece, when adjusted by Purchasing Power Parity is equivalent to 138% of the world's average. GDP per capita PPP in Greece was highest by around 2007-08. * Gradually, the GDP per Capita PPP deteriorated with time. Entire Eurozone saw highest GDP around the same time as Greece. Except 2010, Greece and Eurozone were reacting differently in performance. * The GDP per Capita, in the Euro Area, when adjusted by Purchasing Power Parity is 208% of the world's average. 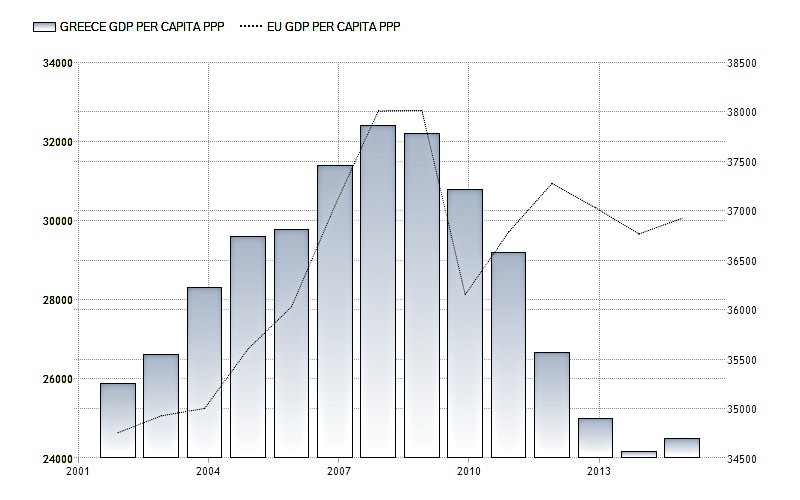 * GDP per capita PPP in the Euro Area was an all-time high in 2008 and lowest in 1990. Greece has a service-based economy and is one of the top tourist destinations in the world. 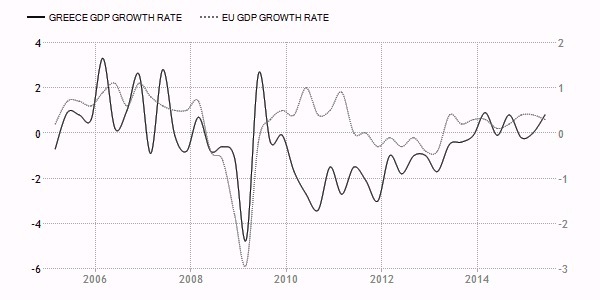 Following the entry to Eurozone in 2001, the Greek economy had been recording high rates of growth. But, this expansion had been powered by access to cheap credit and growth of public sector and so in 2008 the budget deficit and sovereign debt had reached unsustainable levels. As a result, Greece faces the worst crisis since 1974 and tough reforms enforced by the IMF and the European Commission as part of the bailout programme is taking place. * Greece and Eurozone have not matched much in performance owed to complete contrasting performance in 2010-2012. * The Eurozone economy advanced only 0.3 percent in the second quarter of 2015, with German, Italian and Dutch expansion missed expectations while France stagnated. * The GDP growth for region's biggest economies missed economists' expectations. Individually, Germany grew by 0.4 percent, against expectations of 0.5 percent growth. The Italian economy expanded by 0.2 percent; lower than the forecasts. The Dutch economy grew by 0.1 percent and France recorded no growth. Only Spanish economy advanced 1 percent, the fastest pace in more than eight years. Unemployment rate in Greece has always been a problem ever since its economic problems started. It remains high even though it decreased to 25% percent in May 2015 from 25.58 percent in April of 2015. * Greece Unemployment Rate reached an all-time high of 27.91 percent in 2013 and lowest was in May of 2008. 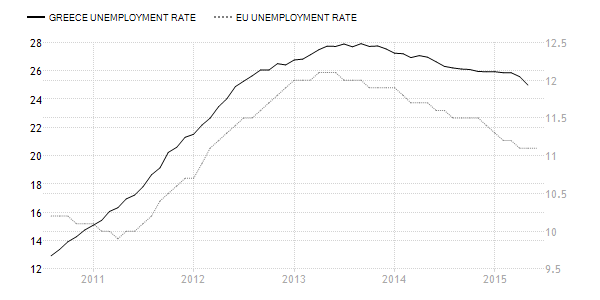 * Unemployment Rate in the Eurozone remained unchanged at 11.10 percent in June from May of 2015. * Unemployment Rate in the Euro Area reached highest in 2013 and a lowest in 2008. Generally, investors use Government debt as a percent of GDP to measure a countries ability to make future payments on its debt. , thus affecting the country borrowing costs and government bond yields. Greece is of the opinion that much of the matters in Greece got worse due to the strict austerity measures imposed by its creditors. An article in the New York Times reports that Mr. Tsipras had blamed the austerity for creating a “humanitarian crisis” in Greece. While Germany blames Greece for failing to use economic overhauls to restart its economy, the IMF has called Greece’s debt “unsustainable”. Even though much of the rescue support is coming from Germany, since it is by far the strongest in the Eurozone, it surely has benefitted in certain sections after the formation of the Eurozone. Recently, the shifting politics in Germany shows that even though 454 German MPs have approved of the Greek bailout, 113 were against it while 18 abstained. Some part of Germany seems a bit hesitant about the third bailout and does not approve of giving extra support to Greece. The €86 billion bailout plan is Greece’s third bailout in the last five years with Spain, Estonia and Austria approving the bailout package. 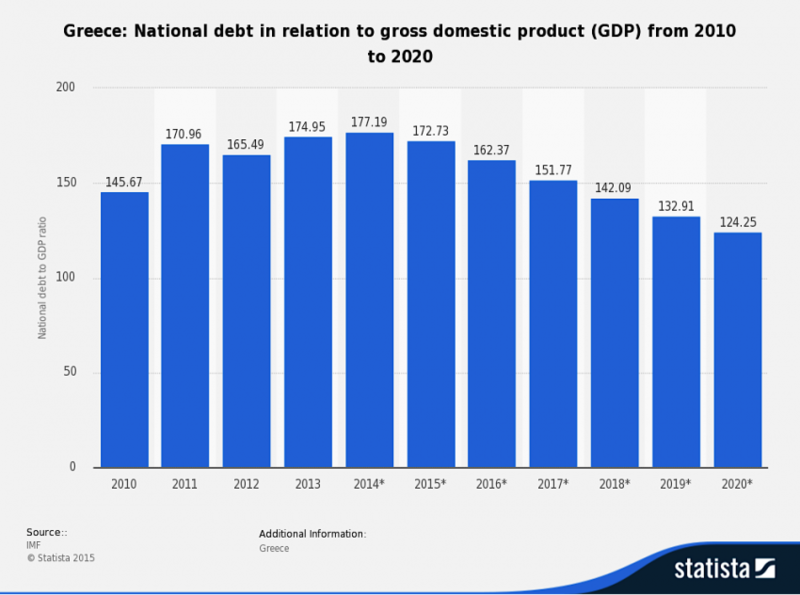 * Greece recorded a Government Debt to GDP of 177.10 percent of the country's GDP in 2014. Government Debt to GDP in Greece was at its peak in 2014 and was lowest in 1980, much before it joined the Eurozone. 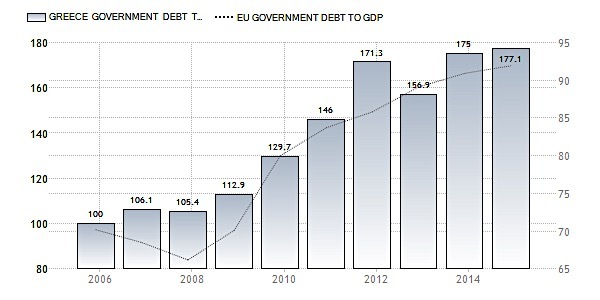 * Eurozone recorded a Government Debt to GDP of 91.90 percent of the country's Gross Domestic Product in 2014. According to Bloomberg, Greek unemployment has doubled since it joined the Eurozone, while Germany halved its unemployment rate. * Even the problem of unemployment, even though stable, remains unaddressed by Greece. * When Greece joined, it had unemployment of roughly 4.7%, but after its inclusion in the Eurozone, the unemployment rate started increasing. 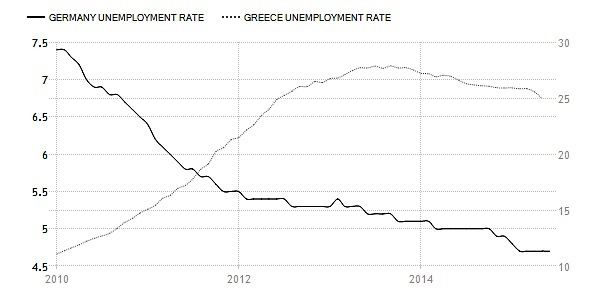 * Greece and Germany have been on different side of the wall when it comes to unemployment rate. * While Greece has seen its unemployment increasing, Germany has seen unemployment getting lesser over time, roughly from the time Greece joined the Eurozone. * Currently, Germany has 4.70% in May 2015; Greece has a disastrous rate of 25% (which means that 1/4th of its population remains unemployed) in 2015.